Like Real Wood, Right Down to the Grain. "Royalwood" Will Take a Stain or Varnish. It Files & Cuts Just Like Wood. Colt Army Special Ivory-Like Grips, Smooth. Also Fits Official Police & Officers Model. Colt Army Special Ivory-Like Grips, Checkered. Also Fits Official Police & Officers Model. Colt Army Special Ivory-Like "Barked" Grips, Smooth. Also Fits Official Police & Officers Model. Colt Army Special Grips, Black. Also Fits Official Police & Officers Model. Colt Army Special Imitation Jig Bone Grips. Also Fits Army Special, Official Police & Officers Model. Colt Army Special Imitation Jig Bone Grips With Medallions. Also Fits Official Police & Officers Model. Colt Army Special Pearl Premium Grips, White. Also Fits Official Police & Officers Model. 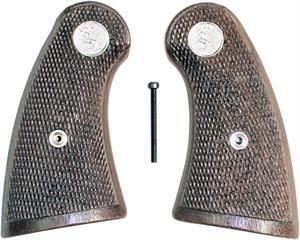 Colt Army Special Imitation Jigged Buffalo Horn Grips. Also Fits Official Police & Officers Model. Colt Army Special Imitation Jigged Buffalo Horn Grips With Medallions. Also Fits Official Police & Officers Model. Colt Army Special Royalwood Checkered Grips. Also Fits Official Police & Officers Model. Colt Army Special Stag-Like Grips. Also Fits Official Police & Officers Model. Colt Army Special Stag-Like Grips With Medallions. Also Fits Official Police & Officers Model.